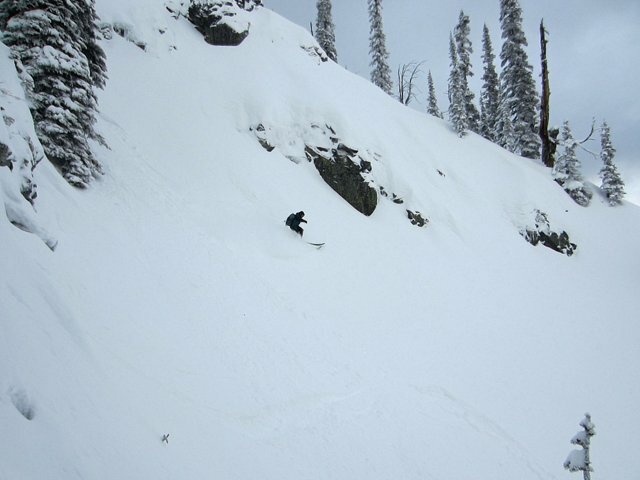 Jordy – Hourglass Chute, Mt Roberts. If the measure of a winter is the number of in-bounds powder days, then this season has come up short. I haven’t been overly concerned, as I’ll always do what it takes to get the powder I need, and otherwise there’s always something fun to do on skis, even if that’s working on one’s best GS racer impersonation. But now that we’re back into a snowy weather pattern, hopes are high for some big dumps. It was a legitimate powder frenzy yesterday morning, with the first real line-ups I’ve seen all season, although the 10cm of heavy snow didn’t quite live up to expectations. Now, with a good soft packed base now covering much of the crap, and back-country conditions consolidating, we just need some of the forecast systems to deliver and we’ll be charging again.